In a match that was never clearly decided until the final whistle, New Jersey and Washington battled relentlessly throughout the cool, comfortable evening. The Spirit Reserves struck the midway through the first half when Jen Skogerboe broke free down the left side and drove a low cross to split two Wildcat defenders. Yensen siezed the opportunity, and plastered her shot into the bottom right side of the New Jersey net for the ultimate game-winner. Yensen’s goal aside, the real heroes of the night turned out to be the cadre of defenders in the Washington defensive third. Fresh off the plane from summer school in Chapel Hill, University of North Carolina center back Satara Murray refused to give a single inch throughout the full ninety minutes. Equally up to the task, Meghan Cox and Monica Mendes held firm to lock down the center while defenders Sam Lofton and super-sub Niomi Serrano gave the Reserves a speedy advantage on the outside. The stout Washington defensive wall helped Spirit Reserves keeper Adelaide Gay earn her third clean-slate shutout in a row. The Spirit Reserves continue their road trip Sunday as the take the short drive north to face the historic New York Magic. Match time is slated for 4:00PM. 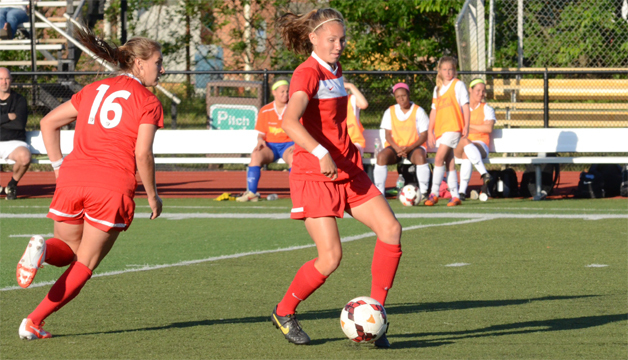 The Spirit Reserves return home June 7th for a rematch against New Jersey. Match time is set for 7:00PM and will be held at Liberty High School in Bealeton, Virginia.